Bonjour encore une fois tout le monde! Hello again curious viewer! You’ve made it back to the second post, Congratulations. 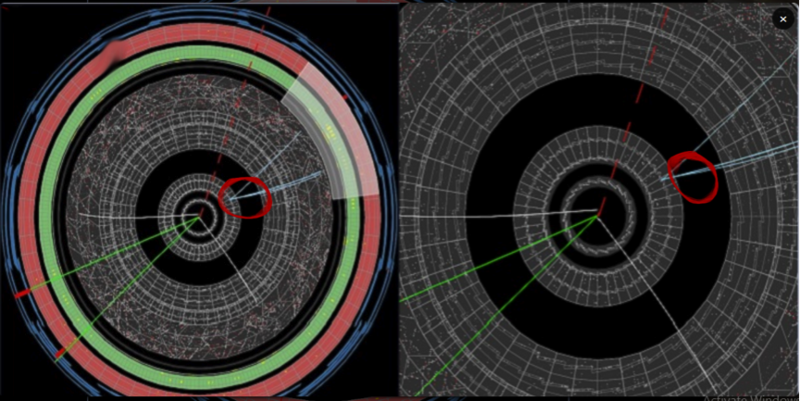 In this post, I will be explaining the physical processes, uses, and definitions involved in a citizen science project calls Higgs Hunters, which includes Higgs Boson particle data classifications. This post will include my personal experiences with classifications, and also what you can do to help the physicists. So, let us move on! Higgs Hunters was started by a group of physicists who research and analyze particle data in the LHC. Most recently, a particle called the Higgs Boson was found. We will be looking into the data from this particle in recordings from the ATLAS detector (see my last post). Now, what is a particle data classification? A particle data classification is just what it sounds like. You’re observing data from a particle collision and recording what you see. The intended event to be observed is called an off-center vertice. An off-center vertice is a line showing the motion of particles that does not originate from the center or create a new vertice after originating from the center. Another word for a particle line is called a branch. Identifying the branches inside of these data sheets can be quite the challenge. To compensate, I have provided a diagram to elaborate on what the citizen scientists are searching for. The pictures below will further elaborate the components in a data sheet. 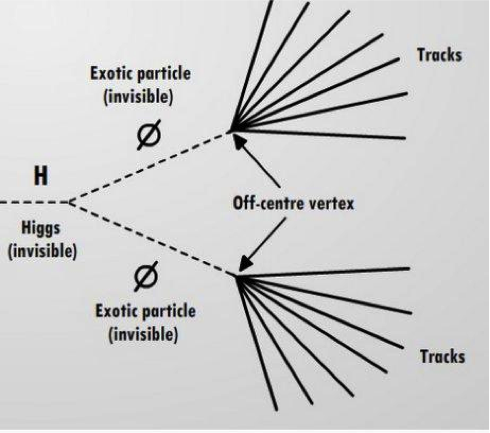 In the first picture below, the “H” indicates the Higgs particle, which is also indicating the center. The dotted line is the path of the particle. The off center vertice occurs when new particles break off from the original particle, creating the new paths that show up as an off center vertice. There are 2 types of images you might classify on the website. One is the original view of the data. The other is called the slice view. I have placed both below (original view is on the left, slice view on the right). Shown in the picture below is a data recording from ATLAS. The colored lines represent the motions of particles, the site also refers to these as branches. Most of them originate from the center. I have indicated the vertices not from the center with red circles. I have done quite a few of these classifications myself. My personal experience with classifying was initially challenging. Overtime, I developed an understanding of a basic data and applied that understanding to the my classifications. I then developed my own method to analyze the data classifications. First, I look at the type of data sheet I have. I notice what is present on the sheet, as in an abundant supply of particle lines, or very few. Secondly, I observed the data for off center vertices. I then indicated the vertice. The amount of branches in some data sheets will sometimes come in a copious sum, the site asks you to record the exact number of branches you see so this made this method play out a bit more challenging than expected. Lastly, I went into detail observe mode. In this, I looked for more minute vertices coming off another off center vertice. This was by far the most complicated part. It took absolute focus and precise observing to classify correctly. A common question is: Why do we need to classify particle data? The answer is quite simple actually. These classifications give the physicist a more accurate understanding of the Higgs Boson particle, or any particle being studied for that matter. Now that you know how to classify, it’s time for you to spring to action and do classifications of your own! “But why do you need me?” Particle studies grant tons of data. All of this data needs to be organized correctly. With your help on the classifications, it will make data organization much easier. It also benefits you with improved knowledge! I have placed the link to Higgs Below. So go on, Happy Hunting! Welcome back citizen scientists! Have you visited Galaxy Zoo Site and classified any new pictures today? Your help is really significant, especially for astronomers. Let me tell you how astronomers use the information that you collected through Galaxy Zoo. Astronomers have used some of those classifications to analyze whether there are some specific types of galaxies found in more dense environments or less dense environments. Amazingly, they found impressive results, that no astronomers had ever realized before. Elliptical galaxies tend to be found in the more dense environments, and spiral galaxies are found in less dense environments. Let’s take a deeper look at an article I read by Dr. Ramin Skibba and the Galaxy Zoo Team. This research mainly compares how clustered galaxies are; based on their morphology, which simply means the shape of the galaxy itself. Astronomers have already known that the galaxies are more clustered than just random clustering. What scientists mean by clustering is how many galaxies are within certain distances of each other. Clustering also relates to how dense an environment looks. For instance, a dense environment has more clustered galaxies at small distances, which also means that there is a larger number of galaxies within a given area. Let’s take a look at the graph on the top, which is from the article I read. 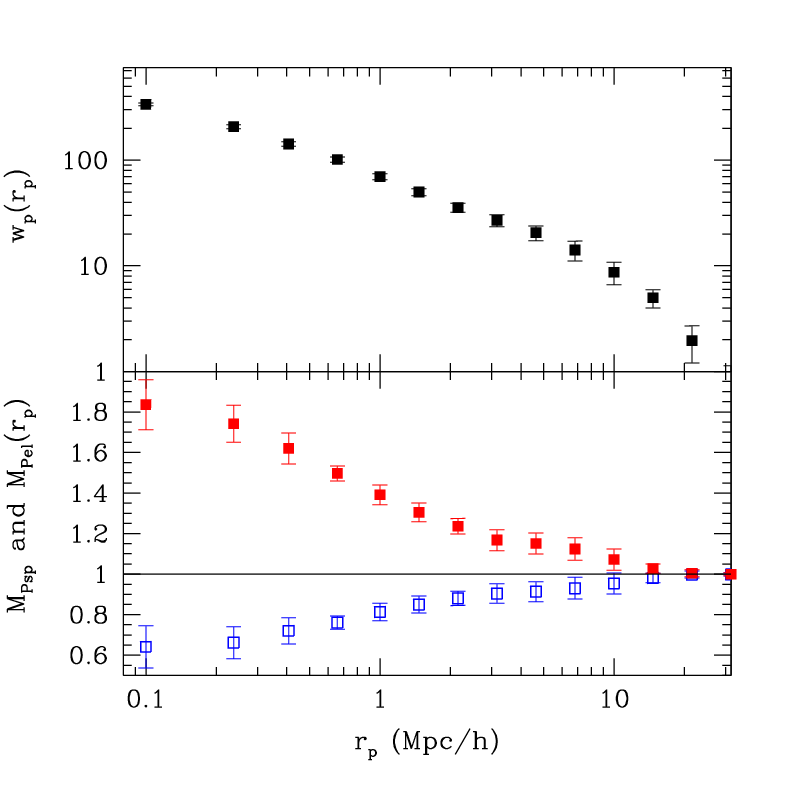 In the upper panel, with the black squares, y-axis indicates how likely galaxies are to be clustered at certain distances between galaxies as shown by the x-axis. So as you see for the black squares when x-value is smaller the y-value is greater, meaning that galaxies are more likely associated with other galaxies if they are near each other. As galaxies get farther apart, they look a bit more random. In the bottom panel, red squares represent elliptical galaxies and blue squares represent spiral galaxies. This information, about the shape of the galaxy, is taken from Galaxy Zoo Data where citizen scientists classified how a galaxy looked. The y-axis is set so values >1 mean they are more likely to be clustered, also values <1 mean they are less likely to be clustered. While x-axis is still representing the distance within between galaxies. Based on the graph, it shows us that elliptical galaxies are more likely to be found within small distances of each other, meaning they live in the more dense environment than spiral galaxies. Well, this article highlights only one of hundreds of results that astronomers have discovered by using Galaxy Zoo data. Astronomers need these large data sets to make their findings more reliable. For instance, pretend that you are collecting the survey about how a galaxy image looks. Here, you can’t just rely on one person to determine whether a specific galaxy image is elliptical or spiral. There is more chance for that person to make a mistake. But, if you have thousands of people vote, and more than ninety percents of them say the same answer, do you think you will have more confidence to make a conclusion whether it is elliptical or spiral? Which method is more reliable and accurate? For those reasons, a citizen scientist’s help matters! Come December 18, “Star Wars” will be back. Some of us will cosplay. Some will cringe. A good few might even cry, though I can’t predict whether those tears will be of joy or disgust. And all of us will look with newfound hope at Luke’s home planet, Tatooine. Its iconic double-sunset was once seen as leaning on the fiction part of science fiction. There was no proof that it couldn’t happen, but history.nasa.gov explains that many questioned whether multi-star systems were stable enough to produce planets. However, views on the likelihood of Tatooine-esque scenarios have changed in recent years. 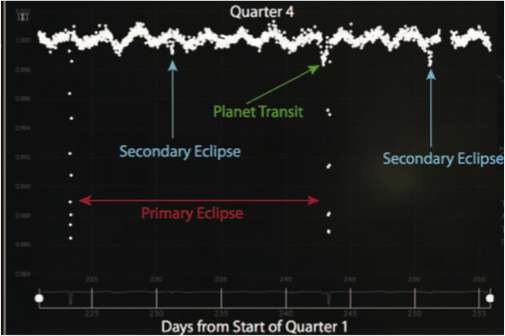 In 2012, the Zooniverse project Planet Hunters discovered a situation even more complex than Tatooine’s, the first planet in a quadruple-star system (PH1/Kepler-64B), with the help of the light curve pictured below. Light curves are graphs that measure the amount of light a telescope receives from stars over time. For more info on light curves, head over to my last post. This specific light curve, used by scientists Kian Jek and Robert Gagliano, shows a few things. First, you have your good old planetary transit. This is the dip created when the planet passes in front of one of the stars. Second, you have your eclipses. The primary eclipse occurs when the dimmer star passes in front of the brighter one, blocking its light. You can see this is when the light curve dips the most, displaying only a fraction of the stars’ normal light. The secondary eclipse is the opposite, occurring when the brighter star blocks light from the dimmer one. The dips here aren’t much different than the planetary transit, so scientists didn’t originally think the binary system contained any planets. So if you’ve been paying attention, this might raise a question: I’ve only talked about two stars, but I did say this is a quadruple-star system, right? PH1 orbits a set of binary stars (two nearby stars orbiting their common center of mass) while another binary set orbits in the distance. Scientists noticed this second set of stars when they started to gather pictures of the whole system, Kepler-64, pictured left. According to astronomy.com, finding planets in multi-star systems isn’t surprising. Those systems outnumber single-star systems like our own. Most of them are gas giants like PH1, and they aren’t suitable for life as we know it, but new mathematical models are showing that Earth-like planets can form in these systems. All this science serves to back up one point — the most important point that could possibly be made: Tatooine-esque planets are a real possibility in this universe. Which means, of course, “Star Wars” is not sci-fi as much as a very well concealed documentary on the wonders of alien life .